I’ve been a little crock-pot happy the last few days (with good reason of course: Crock pots are awesome!). After my happy realization that I could cook dried beans using far less energy than the stovetop, using my crock pot, I decided to take another plunge into the world of slow cooker baking. I made bread in my slow cooker once before (and strangely, that is consistently the most clicked-on post on my entire blog since someone pinned it on Pinterest), but it was a bit strange, with a very hard bottom crust. But after checking numerous sites, I found out the reason for my earlier flaw: direct contact with the bottom of the slow cooker with create a very thick crust. This is easy to avoid by cooking it in another cooking vessel, inside the slow cooker, and raising that vessel up a tad off the floor of the crock pot. So I decided to try with my current favourite sourdough rye bread (a spiked “epoxy” dough from Peter Reinhart’s Whole Grain Breads book–which means it has some sourdough, some soaked dough, and some commercial yeast added on baking day). This morning I got the final dough together and gave it a first rise. Then, without a final proofing, and also without pre-heating the crock pot, I degassed the dough and put it into a well-oiled pyrex bowl which I then perched on a canning ring inside my crock pot. I let it bake for about 2.5 hours, until I could see the top starting to firm up (the top finishes last in this type of baking since the heat doesn’t really make it up that high). Now, bread gourmands would be shocked at this bread I’m sure. It was slightly browned on the bottom, but there was no crackly crust, no maillard reaction, no grigne to speak of. But it was bread. It was even quite good! 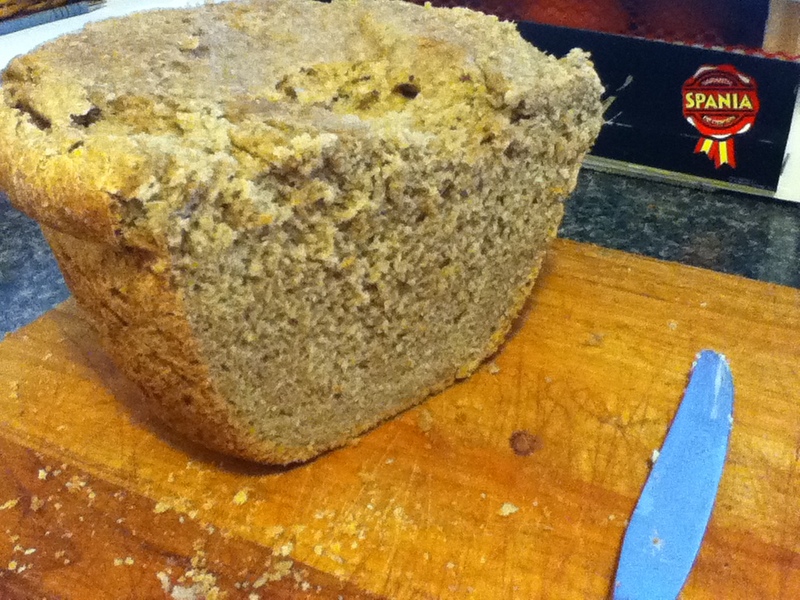 The crumb was open and creamy, as it seemed that the proofing happened inside during the crock’s warm-up. It was well-risen indeed. Actually it seemed a touch over proofed, but just a touch. Still certainly enjoyable. I have to admit, it was very light and fluffy, which I would love to attribute to my amazing kneading skillz, or the crock pot proof, but I think it was probably because I ran out of my usual stone-milled whole wheat and supplemented with some supermarket “whole” wheat stuff that is really just white bread with a bit of bran thrown in. Blush. For future experiments–and I will be doing this again, oh yes–I plan on finding a better baking vessel, maybe a coffee can? I would like something with straight sides, as with my bowl method the dough actually rose up and touched the inside of the lid, which meant some condensation got on the bread which made some really nasty gummy spots. I might also try preheating the slow cooker while I proof the bread a bit outside the oven, to see if I can get it “baking” a bit sooner and lose the over-proofed yeasty taste. In any case, I’m excited for summer baking. I can put my slow cooker on my balcony and enjoy fresh bread without heating up the house! And it also gives me hope for another summer plan: solar cooking! Stay tuned . . . I got Peter Reinhart’s book on baking with 100% whole grains and I’ve been thinking about his methods vis-a-vis the Sourdough Bucket Bread. In his book, he uses what he calls an “epoxy” method to get the most flavour out of the grains. He has two pre-ferments: a soaker and a starter or biga. And then on baking day, he mixes in some commercial yeast, and whatever other ingredients the dough calls for. I’ve now done maybe 3 batches of the sourdough bucket bread, and though it is okay, it does come out a little heavy. I mean, it is a completely lean dough, so there is nothing to lighten or soften it up, so I’m not surprised that it’s a bit dense. So here’s the thought: why not use a portion of bucket dough as the starter portion, and, following Peter Reinhart’s method, combine it with a soaker and some commercial yeast and other ingredients on baking day? I mean, I could just follow one of his recipes directly, but it’s much more fun experimenting. It’s an idea . . . I’ll let you know if I try it! A few of you mentioned that you would take me up on my offer to send you some starter. Finally, after weeks of travelling, xmas activities, and general post-holiday catching up, I’m back to my routine and my starter is in a good enough state to be given away. I’ve got some drying right now and I’ll email those of you who commented before to get your addresses. Oh, and if you’re in the Ottawa area, I would be more than happy to share the love. As for working with the dried starter, there are no guarantees, but it’s worth a try! I would love to know how it works out though. Okay, I’ll be in touch. Since I started my no-knead sourdough bread, I haven’t been relying on my starter as much. Instead I’ve been using a cup and a half of leftover dough to start the next batch, which is as it should be. By taking my starter out of the baking equation, I now have a chance to give my starter some of the TLC that it deserves. I told my daughter today that she does have a sister, since my starter is my other baby. I don’t think she quite got it. Anyway, I’ve been a bit neglectful of my starter lately, leaving her out all the time, feeding her irregularly, not measuring quantities, and she’s been showing it with sluggish behaviour, early hooch, etc. So I’m back on a proper diet and schedule and she’s already showing signs of improvement. I mix together these three ingredients and leave the starter out for 24 hours at room temperature. Then I put it in the fridge for minimum 12 hours. Then I do it again, taking 1 oz from the mixture in the fridge, and adding 1 oz each of starter, water and flour. Leave out for 24 hours, refrigerate for 12 hours, then start again. Keep this up until your starter is vibrant. The link at rec.food.sourdough has a good rubric for figuring out the health of your starter. Once it is vibrant, or as they call it, “fresh”, you can start baking bread with it. Another thing you can do to help it along is to feed it with rye flour. For some reason the rye makes it really go crazy, like mine did yesterday. Good luck with your starters! 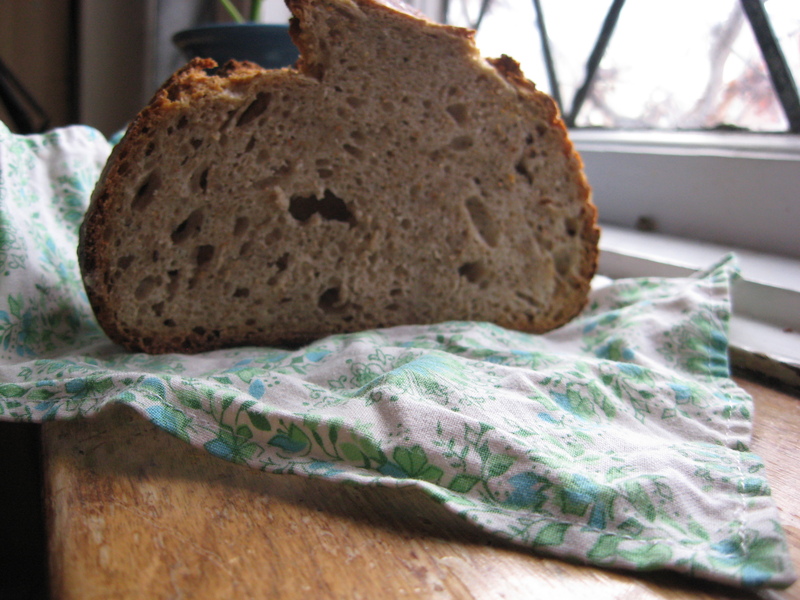 Oh, how I love the sourdough eCourse! I’ve done fabulous English Muffins, a big ole pancake, and tomorrow we’ll make some muffins! Yep, sourdough muffins. I’ve also watched the lessons on cake and on cinnamon rolls–yum!! These baked goods use baking soda right before baking so it’s not chewy like bread, but fluffy like, well, like baked goods! The other thing that the baking soda does is react with the acids in the sourdough to produce lots of bubbles. Besides puffing up the treats, this also neutralizes the acids, taking away the sour taste. So in case you were worrying, there’s no weird sweet-and-sour thing going on here. What we accomplish by using an overnight soak with the sourdough is that the phytic acid that is naturally present in bran is neutralized. Phytic acid is called an “anti-nutrient” because it has a nasty habit of binding with good nutrients and taking them out of your body. You want to reduce the phytic acid content of whole grains as much as possible through soaking, sprouting or souring before eating.